I saved this post in draft last month because I didn't have time to write it due to the holiday season. Of course, I didn't write how I found Harlan Poor's death, or saved the records, and had to re-do my research. I was sure I had added it to my genealogy software, but it isn't there. Harlan A. Poor, the son of Samuel and Eleanor (Begole) Poor, was born around 1844-1845 in Michigan. Harlan A. 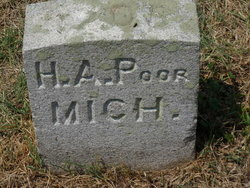 Poor is my second great-uncle, the brother of my great, great grandmother Elizabeth Poor Fenn. He died in the Battle of Spotsylvania on 12 May 1864. I had to do a little research as I didn't know there was a Battle of Spotsylvania and then I discover it was one of the bloodiest in American History. 18,000 Union soldiers and 10,000 Confederate soldiers lost their lives over the two week battle. A virtual tour of the Spotsylvania Battlefield can be found online at the Fredricksburg and Spotsylvania National Military Park website. I do know that Harlan A. Poor enlisted in Kalamazoo, Michigan for the Civil War on 22 July 1862. This record can be found at ancestry.com under the U.S. Civil War Soldier Records and Profiles by searching for Harlin A Poor. He enlisted in Company D, Michigan 17th Infantry Regiment. The next record I found was the Roster of Union Soldiers Buried at Fredricksburg National Cemetery. Information on how the records were compiled is included. Harlan A Poor is listed on page 147. The entry below is the information found. "(1205) Poor, Harlan A. (ROH has Pool) Private. Co.D, 17 MI. Age 18. Res - Johnstown. Enlisted 22 Jul, 1862 at Kalamazoo for three years and mustered in 11 Aug, 1862. Killed in Action at Spotsylvania 12 May, 1864 (SR). Originally buried at Beverly's Farm, Spotsylvania (ROH)"
Further research found the above record at ancestry.com. 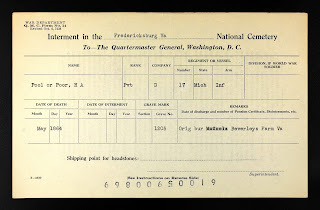 It is the U.S. National Cemetery Internment Control Form for H. A. Pool. 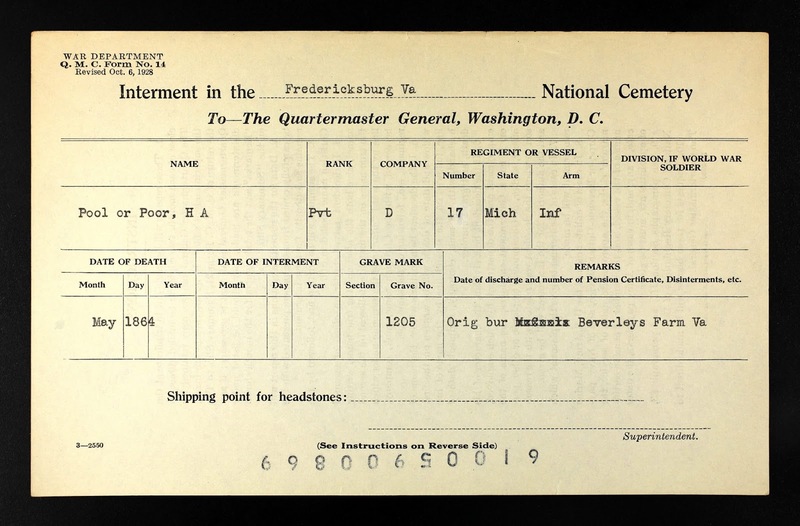 The information provided is very similar to the record from Fredricksburg National Cemetery Roster. Lastly, Find-a-Grave has a memorial for Pvt. Harlan A. Poor. Someone else set up the memorial and transferred it to me. Harlan A Poor was originally buried at Beverly's Farm in Spotsylvania and removed to Fredricksburg, Virginia. More research is needed on Harlan Poor and I look forward to that research. Where in the World is David Watt?